A Central Pollution Control Board (CPCB) report of 2015 brought out the fact that 61,948 million litres of urban sewage is generated on a daily basis in India. But the cities have an installed sewage treatment capacity of only 38 per cent of this. In reality more than this amount goes untreated into the rivers or water bodies as the treatment capacity of major sewage treatment plants (STPs) in the country is around 66 per cent of the installed capacity as per CPCB findings of 2013. As a result, more than 38,000 million litres of waste water goes into the major rivers, water bodies and even percolates into the ground every day. Over and above this there is industrial effluent. The data on the raw sewage from rural areas is not available. In April 2015, CPCB issued directions to all the state pollution control boards/pollution control committees in the country for setting up of STPs in their respective states so that untreated sewage does not enter the rivers. The same directions were also issued by CPCB to all 69 municipal authorities of metropolitan towns and capital cities in October 2015. Crores of rupees have been pumped in for cleaning rivers under the Centre’s National River Conservation Plan (NRCP), Atal Mission for Rejuvenation and Urban Transformation (AMRUT), Smart Cities Mission programmes of the Ministry of Urban Development and the “Namami Gange” under Ministry of Water Resources, River Development and Ganga Rejuvenation (MOWR). Ministry of Drinking Water and Sanitation (MDWS) is taking care of the sanitation projects for villages near Ganga along with MOWR. The Ministry of Environment, Forest and Climate Change has so far released Rs 2,066.98 crores for implementation of various pollution abatement projects and STPs of capacity 2,446.24 million litres per day (MLD) under NRCP. Till March 2017, around Rs 7,000 crores was spent only for cleaning the Ganga, as noted in an order of the National Green Tribunal (NGT). The states are also getting financial assistance in the form of loans and grants that are sanctioned by foreign agencies. The concerned citizens and civil societies have moved the courts time and again to save rivers from pollution. In March 2017, Uttarakhand declared Ganga and Yamuna as living entities thinking that this will conserve and rejuvenate the rivers faster. But in July, the Supreme Court stayed the order taking note of its legal and administrative ramifications. Still pollution level in rivers of India has not shown any sign of improvement. Around 302 polluted stretches on 275 rivers have been reported recently (See ‘Extent of contamination’,). The top five states showing maximum number of polluted stretches are Maharashtra, Assam, Madhya Pradesh, Gujarat and West Bengal. Estimated polluted riverine length is 12,363 km, which is almost five times the length of Ganga main stem. 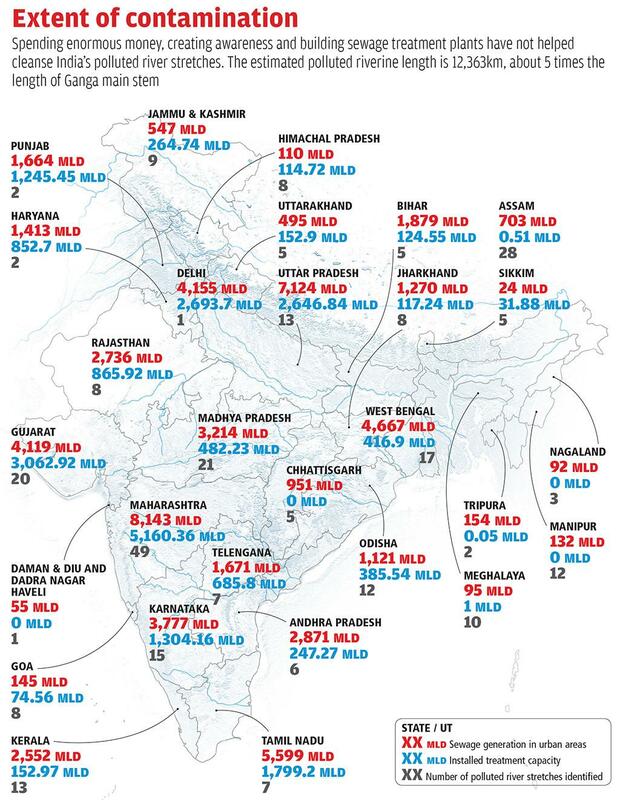 The Central Water Commission (CWC) report gives the maximum and minimum Biochemical Oxygen Demand (BOD) of river water between 2012-13 and 2016-17—hence a conclusion whether there is any change in pollution trend across 4-5 years due to implementation of different sewerage systems is difficult to draw. Data of total 222 CWC water quality sites was analysed and it was found that water quality at 67 locations is beyond the permissible limit. Out of the 67 sites, 14 sites show BOD more than 30 mg/l, falling under severely polluted, 12 sites show BOD between 10-30 mg/l and 30 sites show BOD 3-10 mg/l which are also substantially polluted. Other 11 sites are also polluted showing BOD range above the permissible level. Since cleaning Ganga and its tributaries has always been the priority for the Central government, hence the monitoring of the pollution of the rivers and availability of data in the public domain is accessible. When the National Democratic Alliance (NDA) came to power at the Centre in 2014, cleaning of the Ganga was declared a priority. An umbrella programme Namami Gange was created in 2015 and a budget of Rs 20,000 crore was allocated for 2015-2020 and the cleaning of the river and its tributaries started. Namami Gange was even given a status of an authority in 2016. In August 2017, data from MOWR shows that around 163 projects were sanctioned under Namami Gange, to cover all the ongoing and new initiatives. Out of 163 projects, 41 projects have been completed so far. In these completed projects 223.13 MLD of sewage capacity have been created along with 1,339 km of sewer network. The ministry’s website says that around 46 sewage treatment projects were launched under Namami Gange (May 14, 2015 to September, 2017). These sanctioned projects will create sewage capacity of 760 MLD in river Ganga. The details of this document show that none of these projects were completed till October 2017. This means that whatever projects were claimed to be completed by MOWR were sanctioned pre-Namami Gange. However, in an announcement made by MOWR in October 2017, when Namami Gange completed one year as an authority, it was seen that 44 STPs were sanctioned under Namami Gange with a sewage capacity of 1,402.25 MLD. Nothing really moved on STPs under Namami Gange. The only projects perceived and started on the ground under Namami Gange were that of surface cleaning. Around 11 trash skimmers had been deployed at Haridwar, Garhmukteshwar, Kanpur, Varanasi, Allahabad, Patna, Sahibganj, Nabadwip, Kolkata, Delhi and Mathura Vrindavan. Around 1.3 million toilets were also constructed in rural areas near Ganga to reduce sewage inflow into Ganga and latest figure from MDWS show that the coverage of household toilets in these villages was 99 per cent. But no improvement was observed in the river water quality in the whole Ganga basin. This was because solid and liquid wastes are not managed in a planned and scientific way. Between 2014-15 to 2017-18, around Rs 1,942 crore has been spent against the allocated amount of Rs 3,633 crore. This means that only 10 per cent of Rs 20,000 crores allocated by the Union government has been spent till June 2017 and by 2020 the rest needs to be spent. In March this year, the Central government justified that the causes of the delay in implementation of the projects were tendering process, retendering, non-availability of land, legal issues, natural calamities like flood and earthquakes and delay in permission from local authorities on road cutting/crossing. The data of CWC (collected between May 2016-June 2017) shows that the average BOD value (a parameter to measure the pollution level) of Ganga between Garhmukteshwar and Shahzadpur was not even suitable for outdoor bathing. Between 2006 and 2016, if the quality of Ganga is analysed for two major hotspots— Kanpur and Varanasi during the monsoon period when there is dissolution of contaminants—it is found that quality of river never dropped below 3 mg/l (CPCB standard for outdoor bathing) for Kanpur whereas there has been slight improvement in the quality of river at Varanasi. But at the same time the entry of raw sewage in the river at Varanasi did not stop between 2006 and 2016; this is indicated by high faecal colliform levels in the river water (higher than 2,500 mpn/100 ml). But the Central government denied any such increase in the pollution trend in the monsoon session of Lok Sabha in 2017 although they agreed that there has been continuous entry of wastewater from the human settlements and industries. In 2017, when NGT gave an order in response to M C Mehta’s petition on Ganga pollution, the order document clearly showed that there has been a continuous increase in sewage and industrial effluent entering the river since 2008-09. Yamuna also did not show any improvement during the monsoon. The quality of river is not even fit for outdoor bathing. The quality of river is poorer in 2017 in comparison to 2014 and 2016. 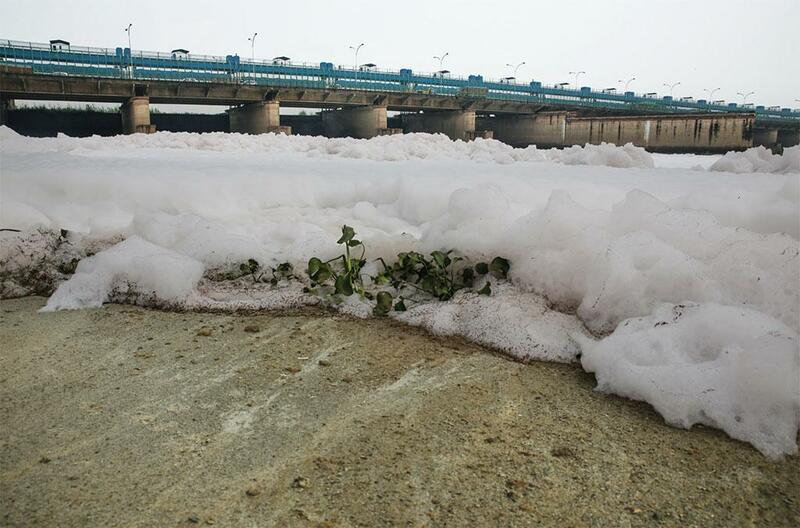 Since 1993, the cleaning of Yamuna is being done under the Yamuna Action Plan (YAP). The Central government is supplementing the efforts of the states to reduce pollution in Yamuna by providing financial assistance to Haryana, Delhi and Uttar Pradesh in a phased manner. The total expenditure incurred on conservation of river Yamuna under the YAP Phase I & II is Rs 1,515 crore. Under Phase III, the Japan International Cooperation Agency assisted project is under implementation at an estimated cost of Rs 1,656 crore for rehabilitation and up-gradation of existing STPs (950 MLD) and trunk sewers (43 kms) in Delhi. In 2016, NGT had given directions to take up cleaning of the Yamuna under Maily Se Nirmal Yamuna Revitalisation Plan, 2017. Accordingly, the Delhi Jal Board that looks after water and sanitation of the city, has submitted a priority list of projects amounting to Rs 1,969 crore to be taken up under Phase I of Maily Se Nirmal Yamuna Revitalisation Plan, 2017. The results of all these projects to clean Ganga and its tributaries were not satisfactory according to the experts and in September 2017, the Prime Minister handed over the gigantic task of cleaning Ganga to the Minister for Road Transport & Highways, Shipping and Water Resources, River Development & Ganga Rejuvenation Nitin Gadkari. Soon after Gadkari was entrusted with the Ministry, two STPs—one in Haridwar and another in Varanasi—were approved in a public private partnership (PPP) mode at a combined cost of Rs 325 crore. These were the first two agreements with private sector companies to build STPs under an innovative PPP called hybrid-annuity payment model that the government formulated with the help of the International Finance Corporation. Few more constructions of STPs in Uttar Pradesh, Bihar and West Bengal were announced under hybrid annuity. Only having a large number of sewerage projects and STPs will not clean the rivers. An analysis of 71 cities by Centre for Science and Environment (seventh State of India’s Environment report – Excreta Matters) has shown that sewerage systems are not seen as connected to rivers. The analysis says that a piece of “hardware” is installed and if the water utility does not have money, the hardware does not run. In any case incomplete sewage networks, designed without a specific plan for pollution control, do not clean rivers. Most of the sewerage projects are centralised systems conveyed through pipelines and pumping stations to an STP, where it is supposed to be treated and disposed off. Very little thought is given to the re-use of treated effluents from these STPs. Most of it mixes with untreated effluents from colonies not connected to the sewerage network. The root problems are both programmes—river-cleaning and city infrastructure—remain hardware-driven and marked by poor understanding of the water-sewage situation. In October 2017, the Centre planned to move from hardware focus to bioremediation technologies for cleaning Ganga at 54 new sites. In-situ treatment is simple and easy-to-operate and does not require major modification of the drain, said a note from MOWR. Hence, the Centre understood that the centralised system is not the only solution and it can be supplemented by decentralised techniques. Looking at the long time period of implementation of STPs and their development, the ministry is interested now in such decentralised innovative technologies from different parts of the world. Our government is arranged millions amount for this project namami gange show we should take the help of technology and we should restricted those who use his waste water chemical and also prime minister should be track the progress that what are doing the state government for sewages whose blowing in Ganga river.